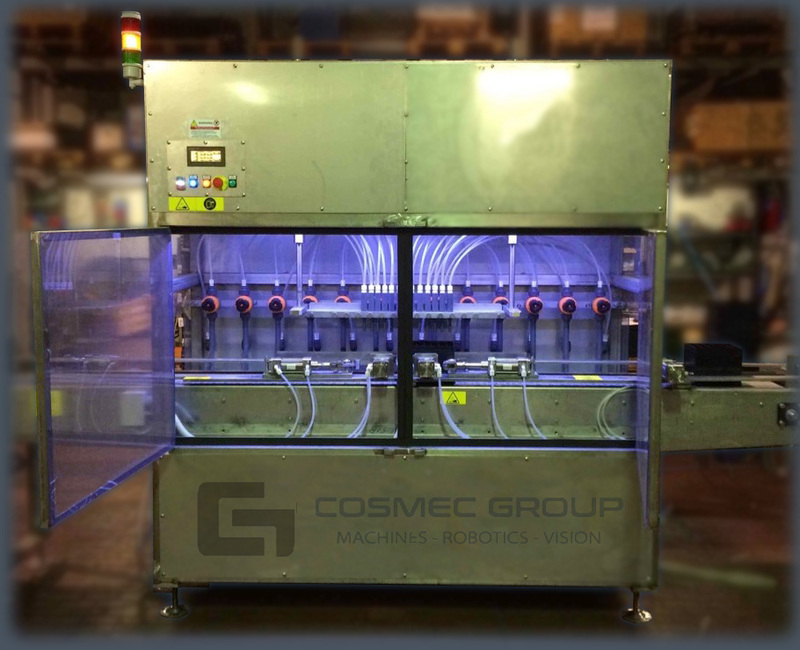 COSMEC GROUP Filling machine is designed to fill the batteries with electrolyte prior to charging. Acid filling machine for car batteries (with a special optional filling head for truck batteries). Up to12 (twelve) batteries/minute filling capability via a completely automatic, high-accuracy system controlled by user-friendly software for ease of change of the parameters with the format. 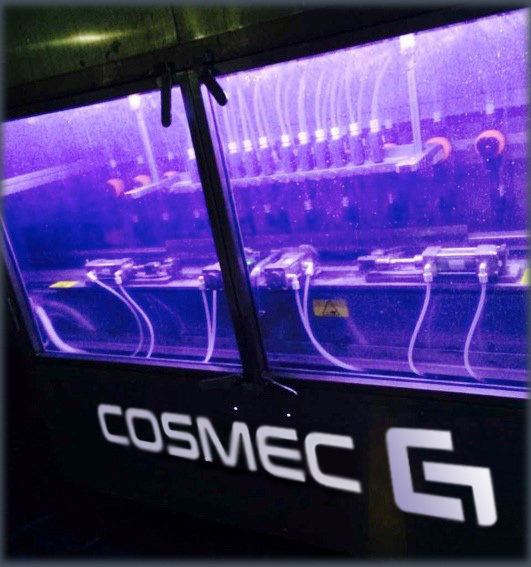 The filling control system provides a gravitational supply of an accurately measured flow of sulphuric acid solution to each cell of the battery. Twelve injecting nozzles can fill electrolyte into two batteries simultaneously. To guarantee the accuracy of the process the injectors are equipped with valves and electronic flow control. The double head of the machine is making it more flexible to production, meaning that process is regulated in order to fill one or two batteries. The equipment operates fully automatically and is designed to be built into an assembly line or other automatic installation. Change over from one battery type to another is completed manually. The acid supply should be connected to the factory store. An automatic level control ensures there is always acid in the tank. The battery enters the filling unit of the machine via the driven roller conveyor and effects the first sensor whereby the fully automatic filling cycle commences. The battery during the cycle is securely held in position whilst the filling head is lowered, and the rubber bugs on the nozzles are pressed against the vent plugholes of the battery to form a seal. Simultaneously the roller conveyor stops, and the vacuum system evacuates the air in the battery, whereby acid from the supply tank is sucked into the battery trough the acid hoses. After a pre-set time, the battery has been filled to the desired level and the redundant acid is sucked back into the expansion vessel. During the latter stages of the filling time membrane valves on the acid hoses open to neutralize the vacuum in the battery, empty the hoses and obtain an even level in the cells. The filling head is raised, and the vacuum system is shut off. A non-return valve in the expansion vessel opens which then drains the acid from the vessel back into the acid supply tank. As the filling head is raised the roller conveyor starts and the battery stop cylinders open so that the battery can be conveyed out of the filling section and a new cycle commences. Electrolyte bath having 200 liters capacity and equipped with automatic electrolyte inlet valve and level sensors. Two main conveyors stainless steel 316 L with anti-acid belt motorized to be integrated in the formation department. 17,5 mt x 2 will be dedicated to the loading trolley, with support guide, 600 mm belt, strong structure in order to allow the batteries to be pushed inside the water baths. 17,5 meters x 2 will be dedicated to the unloading trolley, with support guide, 600 mm belt, strong structure. 20 meters belt motorized 350 mm will be integrated in the formation department in order to connect the different parts and have an in line process. 3 rotating devices and 2 pushing systems will be installed between the conveyors and machine in order to move 90 ° the batteries along the formation department.